Persistence Market Research presents an all-encompassing and one of its kind study of the global liquid ring vacuum pumps market titled ‘Liquid Ring Vacuum Pumps Market: Global Industry Analysis and Forecast, 2016-2024’. This study demonstrates the market dynamics and trends globally across five regions of North America, Latin America, Europe, APAC and MEA which influence the current nature and future status of the global liquid ring vacuum pumps market over the forecast period. In this report, Persistence Market Research gives an overall view of the global liquid ring vacuum pumps market and also throws light on the market sentiment and overall segments of this market. The period of assessment of this report is for eight years and this report enlightens clients on the crucial aspects of the global liquid ring vacuum pumps market in the coming decade. An in-depth study of the market was done by the highly qualified team of analysts of Persistence Market Research and information was collated on the drivers and trends that will influence the market in the coming decade. The report gives a detailed description of the effect these drivers and restraints will have on the global liquid ring vacuum pumps market and this gives a crystal clear picture to clients regarding how the market will shape up in the future. This research report provides a detailed analysis of the global liquid ring vacuum pumps market, while identifying the factors contributing to the growth of the global market. This study offers insights about the market dynamics and trends of various regional markets that are influencing the current nature and future dynamics of the global liquid ring vacuum pumps market during the forecast period. Segmentation comprises demand for liquid ring vacuum pumps in all the regions and important countries in the region. Material type segmentation includes current and estimated demand for materials such as cast iron and stainless steel. While capacity type segmentation includes present and forecast demand for liquid ring vacuum pumps with capacity range such as less than 500 cfm, between 500 cfm and 1500 cfm, and greater than 1500 cfm. Segmentation based on end use industry sectors includes chemical processing, oil and gas, paper and pulp, power, and general process industries. The report provides a market outlook for 2016–2024, and sets the forecast within the context of the global liquid ring vacuum pumps market. In the final section of the report, we have included a competitive landscape to provide clients with a dashboard view. This section is primarily designed to provide clients with an objective and detailed comparative assessment of key players in the global liquid ring vacuum pumps market. Report audiences can gain segment-specific vendor insights to identify and evaluate key competitors based on an in-depth assessment of capabilities and success in the marketplace. Detailed profiles of providers are also included in the scope of the report to evaluate their long-term and short-term strategies, key offerings and recent developments in the global liquid ring vacuum pumps market. This study discusses the global liquid ring vacuum pumps market size and market dynamics. Market size and forecast for each segment have been provided in the context of global and regional markets. Market dynamics prevalent in China, India, Japan, North America, and Europe have been taken into account for estimating the growth of the global market. Market estimates for this study have been based on volume, with revenue being derived through regional pricing trends. The global liquid ring vacuum pumps market has been analyzed based on expected demand. Market data for each segment is based on demand volume and corresponding revenue. Prices considered for the calculation of revenue are average regional prices obtained through primary quotes from numerous regional manufacturers, suppliers, and distributors. All market numbers have been derived on the basis of demand for liquid ring vacuum pumps in different regions. Several primary and secondary sources were consulted during the course of the study. Secondary sources include OneSource, Factiva, Hoover’s, and company annual reports and publications among many others. The report not only presents forecasts in terms of CAGR, but also analyzes the global liquid ring vacuum pumps market on the basis of key parameters such as year-on-year (Y-o-Y) growth to understand the predictability of the market and to identify the right opportunities across the market. As previously highlighted, the global liquid ring vacuum pumps market is split into a number of segments. All segments in terms of material type, capacity, end use industry and based on different regions are analyzed in terms of basis point share to understand individual segments’ relative contribution to market growth. Also, another key feature of this report is the analysis of all key segments in terms of absolute dollar opportunity, critical in assessing the level of opportunity that a provider can look to achieve, as well as to identify potential resources from a sales and delivery perspective in the global liquid ring vacuum pumps market. 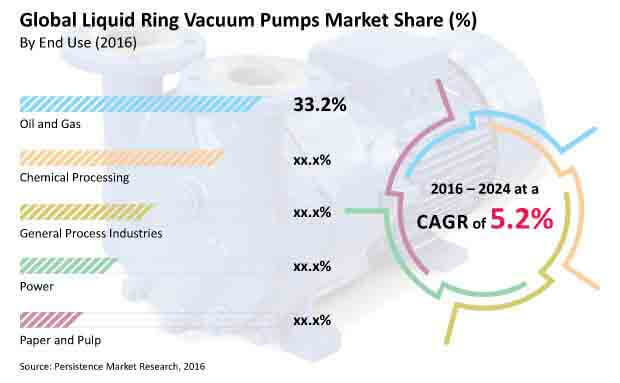 Sales revenue of liquid ring vacuum pumps globally is estimated to increase at a CAGR of 5.2% over the forecast period to reach more than US$ 2,500 Mn by 2024 end. The global liquid ring vacuum pump market is expected to represent incremental opportunity of US$ 954.1 Mn between 2016 and 2024. Consumption of liquid ring vacuum pumps globally is estimated to increase at a CAGR of 4.6% to reach 247,013 units by 2024.